« Evolution with a bullet. Once again, it’s time to play What’s wrong with this figure? Stebbing, A.R.D. 2006. Genetic parsimony: a factor in the evolution of complexity, order and emergence. Biological Journal of the Linnean Society 88: 295-308. – The bar labels. Drosophila is THE official representative of ALL insects now? Good thing Homo sapiens is the representative hominid, ’cause, well, we’re the only ones around. If they’re using model organisms, I don’t see why they don’t just label them by name on the graph, rather than making them stand for a whole group. – The groups. A domain, a pair of phyla, a phylum of its own, a class, a subclass, and two families? Seems like those “representatives” are carrying vastly different amounts of weight. – The “phylogenetic sequence”, with humans at the end…. Like the scratch on the roof of your mouth that just won’t go away. – The Y axis. Why does percent go to 120? – The burning question: How does any organism have 100% non-coding DNA? I sincerely hope the “parsinomy” in the title of the reference was a typo of our dear author’s doing and not actually the published title of the paper. All good points Sylvia, though I am most interested in the “phylogenetic sequence” statement. Who is more closely related to a bacterium: yeast or humans? All seven species have evolved from their common ancestor for exactly the same amount of time. There is no “phylogenetic sequence” that can be used to arrange the bars of the histogram; although you might want to group the five animals together since they are more closely related to each other than they are to fungi or bacteria. The authors clearly are laboring under a false view of evolution. They’re probably thinking of a ladder of life with modern bacteria at the bottom and humans at the top. It’s amazing how many scientists don’t understand evolution. What’s even more amazing is that their ignorance doesn’t prevent them from writing about evolution in their publications. They can be certain their reviewers are just as ignorant as the authors. I am starting to notice a correlation between misunderstandings about junk DNA and misconceptions about phylogenetic relationships. Because they used Microsoft Excel to construct this figure, as a “chart”. That specific error shows up all the time in student lab reports. Does this qualify as a DAP? But seriously, why do the bars go so close to (or all the way to) 100%? 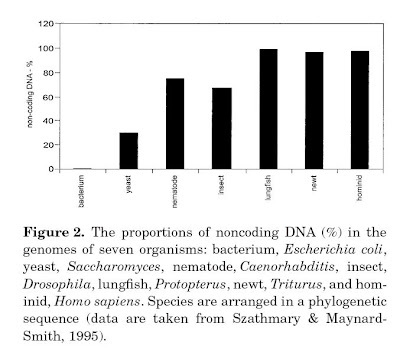 Non-coding DNA is 98.5% of the human genome and (presumably) >99% in newts. But this doesn’t show just how much non-coding there is in newts and lungfishes, which is about 7x (newt) and 35x (lungfish) larger than humans. It could be an illusion, but it seems that they plotted newts with slightly lower percent non-coding than in humans — even plotting them at parity would imply that a newt has at least 140,000 genes because this would have to scale with their genome size of ~25Gb. The percentage of non-coding DNA of Bacteria is grossly underestimated. I should read the paper to see how non-coding DNA is defined, but if it is used as any sequence that does not code for a functional protein or RNA than the percentage should be cc 1o-3o, even if we do not count with the gross overannotation of prokaryotic genomes. The other question is naturally what phylogenic sequence is. This is not an easy thing to define. The way it usually works is that we postulate that the humans are the most advanced creatures on Earth, and than we classify the state-of-the-art factor based on how similar other creatures are to us.Typical antropocentrical view. The problem is that there is very little evidence to suggest that we are the most advanced creatures on Earth, except if we define advancedness by intelligence. I think Dr. Gregory answered your question regarding bar heights. As for Excel’s charts… yes, I’ve met students who are capable of beating Microsoft’s fine products into wimpering submission. This skill is appreciated in undergrads, expected in researchers. Frankly, I’m just happy they didn’t leave the background gray with horizontal black lines running across, and a legend stating “series 1” in blue. Who sets those defaults, anyways? I’m going to go out on a limb here and say “human”, because of horizontal transmission. The larger quantity and diversity of transposons and similar elements in the human genome compared to S. cerevissiae suggests to me that genes (or at least sequences) present in E. coli may also be present in an organism with a long association with E. coli‘s lineage, e.g. H. sapiens. Of course, I’m making some assumptions here, like taking one species as the intended meaning of larger categories such as “bacterium” or “yeast”. Hmmmm… Brummell, whoever your advisor is deserves a kick in the pants for not teaching you the basics of phylogenies. Well, since humans and yeast share a common ancestor to the exclusion of bacteria, we’re both equally related to bacteria.